Many people including doctors are discovering the benefits of probiotics. Probiotics are the friendly bacteria that live in the digestive tract and help to digest food and absorb nutrients. 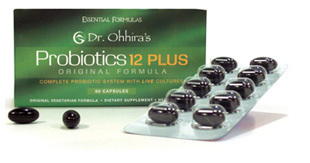 Recently I added Dr. Ohhira’s Probiotics to my health regiment. Dr. Ohhira merged modern science with ancient Japanese fermentation artistry to create a product unlike any other probiotic supplement on the market that uses 100 percent all-natural ingredients that are non-GMO, hypoallergenic (no dairy, soy or gluten) and free of pathogens. Visit Dr. Ohhira’s website for more information. Products for pest control, lawn and garden care are available in independent garden retailers that stock organic products and online. You can read the rest of my health recommendations at: Organic Health & Lifestyles.